North China is one of the areas of strong earthquake activity on the Chinese mainland. Between the 1960s and 1970s, North China experienced the 1966 Xingtai Ms7.2, 1969 Bohai Ms7.4, 1975 Haicheng Ms7.3 and 1976 Tangshan Ms7.8 earthquakes, causing great losses of life and property. The Tangshan earthquake caused 240,000 casualties. In the past 50 years, Chinese seismologists have conducted large-scale deep geophysical exploration and research, obtained the detailed crustal and upper mantle structure, and revealed the deep tectonic environment of strong earthquakes in North China. The resulting research paper has been published in SCIENCE CHINA Earth Sciences by Professor Wang Chunyong at the Institute of Geophysics, China Earthquake Administration. The research group reviewed the main achievements of the studies on the crustal and upper mantle structure as well as the seismogenic environment and tectonic patterns in North China since the 1966 Xingtai earthquake. Based on plate tectonics theory, geoscientists have successfully explained the patterns and mechanisms of earthquake activity on global plate boundaries. However, plate tectonics theory has not explained the occurrence of earthquakes within the continental plate. The geological structure, seismicity and focal mechanism of North China's position on the Asian continent show that the seismic activity is very different from that in the region of the plate boundary, indicating that the seismotectonics in North China are quite complex. The nucleation, occurence and development of continental earthquakes, and their relationship with the deep-seated structure of the Earth are among the most important subjects in solid Earth science. Seismologists have conducted numerous surveys of the crustal and upper mantle structure, and associated studies of seismic tomography in North China. They have finished 42 deep seismic sounding profiles with total depth of ~12000 km, and seismic tomography of three-dimensional crustal and upper mantle structure based on the seismic records at ~600 stations. Deep seismic reflection profiling results indicate a complex tectonic setting in the strong earthquake areas of North China, where a listric normal fault and a low-angle detachment in the upper crust coexist with a high-angle deep fault passing through the lower crust to the Moho beneath the hypocenter. Seismic tomography images revealed that the lithospheric structure in North China is highly inhomogeneous—most of the large earthquakes occurred in the transition between the high- and low-velocity zones, and the Tangshan earthquake area is characterized by a low-velocity anomaly in the middle-lower crust. 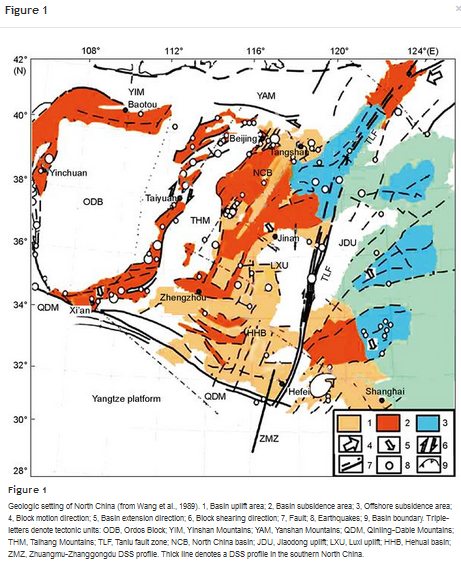 Comprehensive analysis of geophysical data demonstrated that the deep seismogenic environment in the North China extensional tectonic region is generally characterized by a low-velocity anomalous belt beneath the hypocenter, inconsistency of the deep and shallow structures in the crust, a steep crustal-scale fault, relative lower velocities in the uppermost mantle, and local Moho uplift. Earthquake prediction is one of the scientific problems that has not yet been solved. Thorough understanding of the deep tectonic environment of strong earthquakes will help to solve the problem of earthquake prediction. Seismologists Deng Qidong (2008) showed that the surface and shallow-deep tectonic features in the large earthquake area have been relieved by the combination of deep seismic reflection profiling and the surface geology and tectonic environment. Thus, researchers are able to obtain more comprehensive understanding of seismogenic tectonic conditions in the active fold area (the extension zone and the compression zone) of the normal or strike-slip normal fault and the reverse fault. Despite new knowledge from deep seismic exploration and seismic tomography, the complexity of continental seismotectonics still presents some deep-seated problems that need further research.